Previous year's winners are not eligible to compete in the same age category. Fairest of the Fair winner must compete at the State Fair's Fairest of the Fair competition in January or forfeit the crown to the first runner up. No exceptions. Fairest of the Fair contestants must be a resident of DeKalb County. Winners of Monday nights are expected to help with the remaining pageants for the week. Fairest of the Fair Queen will help with Tuesday and Thursday nights pageants. Junior Fair Princess queen will help with Wednesday and Friday nights pageants. No refunds given for any reason including sickness, injury or absentee patient in eligibility. Contestants will be Judged fairly with no consideration of race, prior pageant awards, etc. Contestants may wear any style/length dress-make up is optional for all ages. Contestants arriving late may not be allowed to compete at pageant has already begun. One (1) courtesy gate admission allowed per pageant/guardian of contestant. One contestant is checked in and has number parent (s), other family members or friends are not allowed back stage. Failure to comply could cause disqualification of contestant. DO NOT CALL THE FAIR OFFICE WITH QUESTIONS. *Check-in location is backstage a the Lions Pavilion. This where contestants will receive their contestant number and put into the line up positions. ** Parents of contestants in Monday. Tuesday & Wednesday night's pageants are asked not to be backstage after the contestant has received their number is lined up. One parent is to be backstage with baby/toddler contestant. 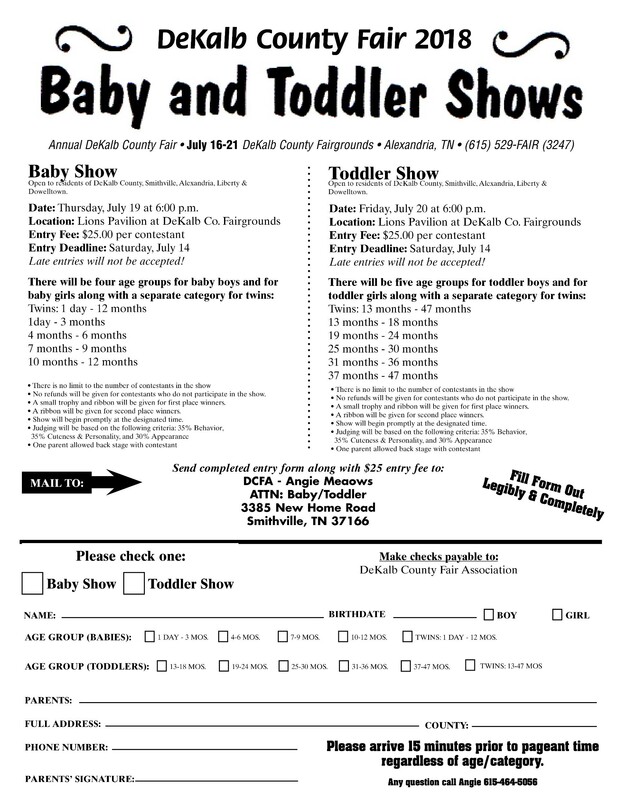 $25 entry fee (cash, check or money order only, made payable to the DeKalb County Fair Assoc.) This fee includes entry in the Photogenic Contest.